Start with a bag of dry beans — red, black, pinto, or a mix. I am not a fan of kidney beans, but don’t let me stop you if bite-sized balls of fiber supplement are your thing. Put a couple cups (or so) of beans into a container with twice their volume in water, and leave it in the fridge at least overnight, and not more than a couple days. What, you think canned beans would be easier? Canned, ready-to-heat-up beans are a scam to get you to pay extra for water and hormone-disrupting can-liner chemicals. It’s not that hard to put some beans in water before you go to bed, for crying out loud. Prepare about a pound of meat. This should preferably be beef, and ideally one of those “stew meat” packs of odd fatty bits. But really chicken or pork or turkey would work just fine, too, and it could be ground instead of a pile of discrete chunks. You can also forget the meat and add more beans (say, about twice as many as you would otherwise) if you’re so inclined. Anyway. If the meat isn’t already cut up into chunks, cut it up into chunks. Heat up some sort of cooking oil or other fat (I use olive oil, because I use it for everything) in a frying pan and brown the meat, stirring occasionally, while you prep the vegetables. Chop up a medium onion, a big bell pepper (or an equivalent volume of smaller peppers like poblanos), and a pile of something hotter, like jalapeños. (“A pile” = from four to half a dozen, for you folks using the metric system.) Dump the chopped vegetables into a multi-quart pot with some more oil or fat and a pile of cloves of garlic, which you have peeled, then minced or chopped or run through a garlic press, according to your preferences and upbringing. Turn on the heat and sauté the vegetables until they soften, but not till they’re cooked completely. When the vegetables are done and the meat is seared, with tasty brown bits, dump the meat into the pot with the vegetables, and add a lot of spices. Like, multiple tablespoons of chili powder, a good dose of cumin, and a heap of oregano. Maybe some cayenne powder, if you’re not sure the spicy peppers will add enough heat. Remove the shaker-tops and just dump from the jars. Also add more salt than you think you need. Salt, as I learned from a friend in grad school who made amazing curry, helps you taste the other spices. Plus, you’re about to add a whole bunch of bland stuff (beans) to what looks, right now, like a sub-par stir-fry. Don’t skimp. Stir in the spices and salt to coat the meat and vegetables. Then dump in the soaked beans. Separate out whatever water hasn’t soaked in, to the extent you can. Also add two 28-ounce cans of tomatoes, in some form. I like one can of diced and one of crushed, for textural variety and to provide a good saucy base, but don’t overthink things. (But then again, don’t go with whole canned tomatoes. Those will just make for more work.) Stir it all together and turn up the heat to get it simmering. If it bubbles thickly, like a swamp in a B-movie, add in the separated-out bean-water, and tap water if you need more, until it’s thin enough to simmer. Taste it, decide that it needs more spicing, and dump in a bunch more chili powder, oregano, cumin, and maybe cayenne. Cover the pot and keep it simmering, stirring occasionally, at least until the beans are soft — usually this is about the time it takes to cook a couple cups of rice, which I like with my chili. The longer you let it simmer, the softer the meat will be. In fact, if you have a sufficiently big crock pot, you can dump everything in there after the initial meat-browning and vegetable-cooking steps and let it go on medium heat for eight hours or however long you spend out of the house for a workday. The chili is ready when the beans are soft and the meat falls apart, or when your apartment has filled with the smell of garlic and chili and browned meat and you are helpless to resist. Serves eight or more all at once, or one for more than a week, depending on whether and how you pair it with rice or bread — and it keeps nicely in the freezer, too. 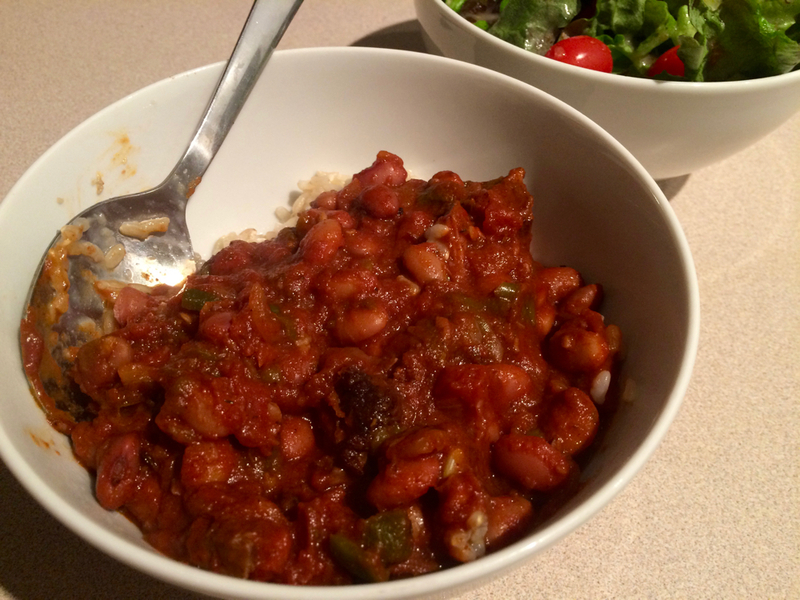 This entry was posted in attempted humor, culture, writing and tagged chili, food, recipe by jby. Bookmark the permalink.